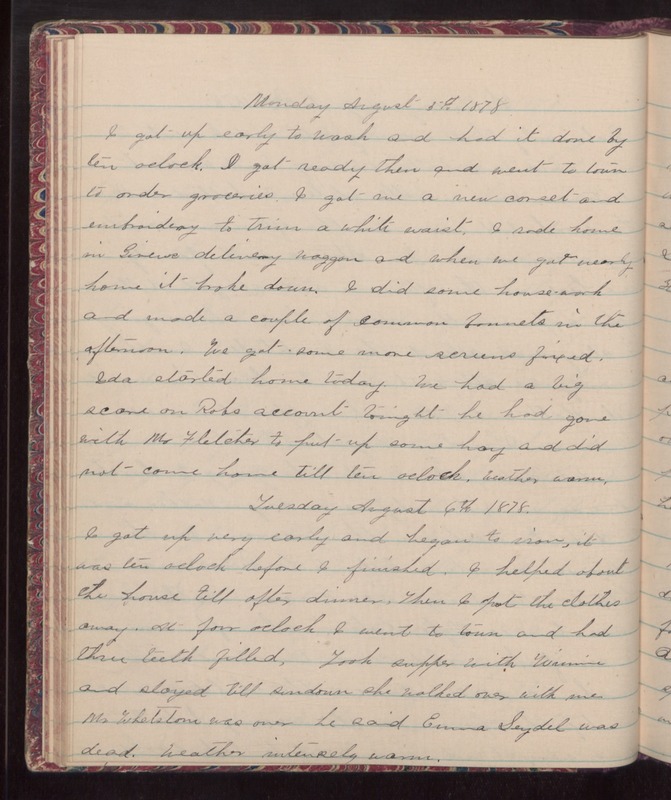 Monday August 5th 1878 I got up early to wash and had it done by ten oclock. I got ready then and went to town to order groceries. I got me a new corset and embroidery to trim a white waist. I rode home in [illegible] delivery waggon and when we got nearly home it broke down. I did some house-work and made a couple of common bonnets in the afternoon. We got some more screens fixed. Ida started home today. We had a big scare on Robs account tonight he had gone with Mr Fletcher to put up some hay and did not come home till ten oclock. Weather warm. Tuesday August 6th 1878 I got up very early and began to iron, it was ten oclock before I finished. I helped about the house till after dinner. Then I put the clothes away. At four oclock I went to town and had three teeth filled. Took supper with Winnie and stayed till sundown she walked over with me. Mr Whetstone was over he said Emma Seydel was dead. Weather intensely warm.